President Trump announces his new policy on Cuba. 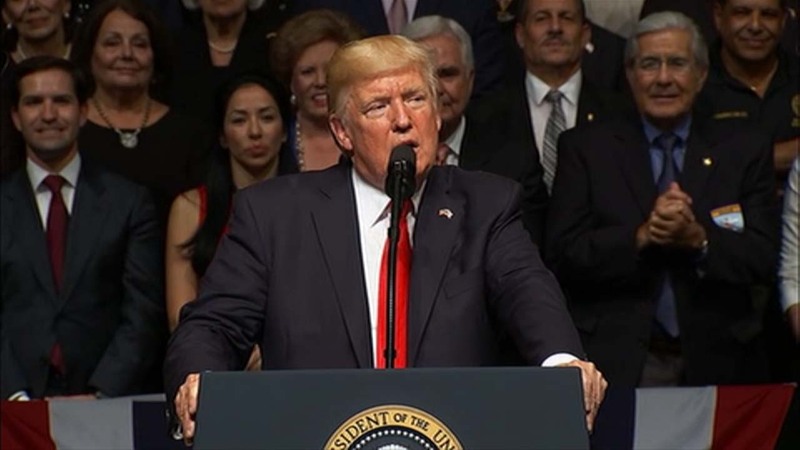 MIAMI -- President Donald Trump declared Friday he was restoring some travel and economic restrictions on Cuba that were lifted as part of the Obama administration's historic easing. He challenged the communist government of Raul Castro to negotiate a better deal for Cubans and Cuban-Americans. Announcing the rollback of President Barack Obama's diplomatic opening during a speech in Miami, Trump said Cuba had secured far too many concessions from the U.S. in the "misguided" deal but "now those days are over." He said penalties on Cuba would remain in place until its government releases political prisoners, stops abusing dissidents and respects freedom of expression. "America has rejected the Cuban people's oppressors," Trump said in a crowded, sweltering auditorium. "They are rejected officially today - rejected." Though Trump's announcement stops short of a full reversal of the Cuba rapprochement, it targets the travel and economic engagement between the countries that has blossomed in the short time since relations were restored. The goal is to halt the flow of U.S. cash to the country's military and security services in a bid to increase pressure on Cuba's government. Embassies in Havana and Washington will remain open. U.S. airlines and cruise ships will still be allowed to serve the island 90 miles south of Florida. The "wet foot, dry foot" policy, which once let most Cuban migrants stay if they made it to U.S. soil but was terminated under Obama, will remain terminated. Remittances to Cuba won't be cut off. But individual "people-to-people" trips by Americans to Cuba, allowed by Obama for the first time in decades, will again be prohibited. And the U.S. government will police other such trips to ensure there's a tour group representative along making sure travelers are pursuing a "full-time schedule of educational exchange activities."